My vegetable vendor brought home some fresh red sorrel leaves this morning. Prepared a rice dish on the lines of tamarind rice and use sorrel leaves as the main ingredient to provide the tart flavor. A unique Andhra favorite among the ‘gongura’ lovers. 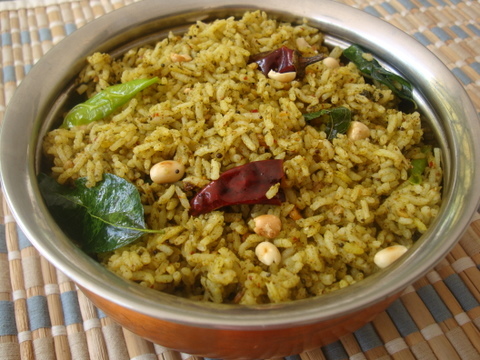 The factor that makes this rice special is the tart flavor of roasted gongura flavor which melds beautifully with mustard, fenugreek and red chilli spices yielding a sensational one pot rice dish. A complete vegetarian meal along side a bowl of yogurt and papad. I have never heard of gongura pulihora before but it looks yummy. Being an Andhrite I’m an ardent lover of gongura and tried many different recipes but not this one. Thanks for your creative recipes, will try this one soon. Another great recipe from you. Will try this recipe the next time I get hold of gongura. Wow, Even though i am a big fan of sorrel leaves i never heard of this before. This is a must try for me, thanks for sharing. omg! this looks sooo good. My mouth is watering. Wow, This looks yummy. I never heard of this. Will definitely try. Thanks for sharing Sailu garu! Hey Sailu.. That does look like a fabulous rice prep. Will keep in mind. Thanks and cheers! I am an ardent fan of your blog and most of my cooking comes directly from your recipes. I love pulihora. But what are red sorrel leaves? A picture would help as I live in Dubai and need to figure out where can I find it. I had earlier blogged a meat recipe using sorrel leaves, Mutton Gongura. I have posted a picture of red sorrel leaves in the post. à°—à±‹à°‚à°—à±‚à°° à°ªà±à°²à°¿à°¹à±‹à°° à°…à°¨à°—à°¾à°¨à±‡ à°…à°¬à±à°¬à°¾! à°¨à±‹à°°à±‚à°°à°¿à°ªà±‹à°¯à°¿à°‚à°¦à°¿. :).à°‡à°• à°ˆ à°ªà±à°²à°¿à°¹à±‹à°° à°šà±‚à°¡à°—à°¾à°¨à±‡ à°¤à°ªà±à°ªà°•à±à°‚à°¡à°¾ à°šà±‡à°¸à±à°•à±‹à°µà°²à°¸à°¿à°‚à°¦à±‡ à°…à°¨à°¿ à°¡à°¿à°¸à±ˆà°¡à± à°à°ªà±‹à°¯à°¾à°¨à±. à°§à°¾à°‚à°•à±à°¸à± à°«à°°à± à°¦à°¿ à°°à±†à°¸à°¿à°ªà°¿. I’m afraid there is no replacement for gongura leaves in this particular recipe. gongura and pulihora r both my favourites….but never heard of a recipe like this..a great believer and follower of ur receipes..certainly this sunday i’m going to have it..
Looks so yummy…I checked with my veg. vendor and he says there are 2 types of gongura, konda gongura & normal one. So which is to be used in this? I am not sure about Konda Gongura. There are two types, Erra gongura (red sorrel leaves) and Thella gongura (white sorrel leaves). 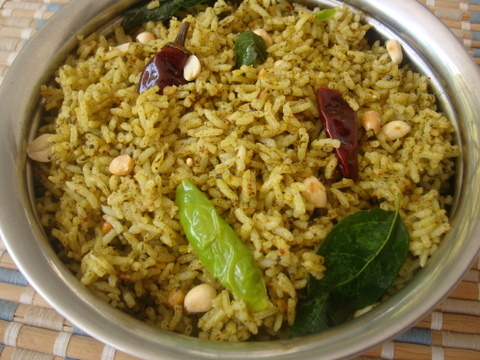 Use red sorrel leaves for the rice preparation and white sorrel leaves for pachadi. I made it last night with fresh gongura. Turned out Superb!!! Thank you. Your dish Gongura Pulihora looks tempting.Would like to find out what Red Sorrel leaves translates into english or hindi. Its called Ambadi/Ambada in Hindi. sorell leaves in Hindi is amote ki bhaji ,and Amanda in English is meant. Amanda in English is kenaf. Hi Sailu, I came here searching for gongura pacchadi recipe and found this…quite creative idea. I am changing my mind to cook this now and try the pacchadi next time. Making this for the second time in my kitchen. Thanks for this healthy recipe. Hai Sailu Ma’m, ur recipes r gr8, i need a urgent clarification, is tamarind required for this dish? There is absolutely no need for tamarind as the sorrel leaves provide the tang to the dish. Since you are roasting the leaves till rawness disappears, there is no need to fry the ground sorrel paste. Hi Sailu gaaru, thanks for uploading and posting such yummy recipes which are worth trying and repeating. Please could you post us a recipe of avakai pappuannam which once I had at a marriage in Hyderabad, which was too yummy, I am looking for such dish once again.